Shots have been fired along the Korean border, and Pyongyang has placed its military in a “quasi state of war.” A May 2015 report from the Socionomics Institute found that North Korea’s willingness to play nice on the international stage waxes and wanes with trends in the KOSPI, the benchmark stock index on the Korean Peninsula. 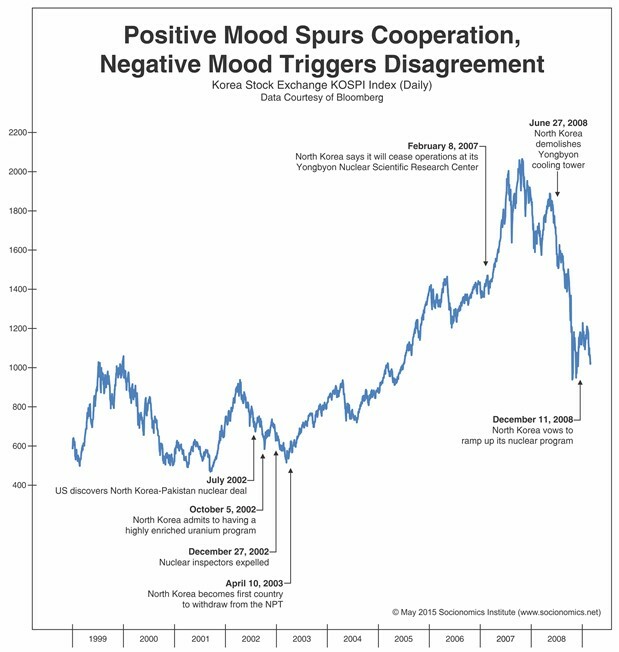 Stock market indexes reflect the underlying social mood—positive mood drives markets higher and inclines countries toward peace; negative mood drives markets lower and inclines countries toward conflict. With the recent stock market collapses in the US, South Korea, and many countries across the globe, tensions between South Korea and North Korea could intensify. For a copy of the study or to schedule an interview with the author of the report, contact Miguel Casellas-Gil MiguelCG@newsandexperts.com, 727-443-7115 Ext. 214. About The Socionomics Institute The Socionomics Institute, based in Gainesville, Ga., studies social mood and its role in driving cultural, economic and political trends. The Institute’s analysis is published in the monthly research review, The Socionomist. Work by the Socionomics Institute and other socionomists has been covered by The Atlantic, Barron’s, CNN, Esquire Magazine, Forbes, The Futurist Magazine, The Hill, MarketWatch, Mother Jones, Nature, NBC News, New Scientist, Science, TIME, USA Today, The Washington Post, Yahoo Finance and others.